The belt grinding and polishing machines of the SMG 58 series are versatile with their different motor outputs. The SMG 58 series is a universal machine for industrial use due to its double-sided design with optional combination of belt grinding and polishing, belt grinding only or polishing only. One highlight are the two add-on motors, which can be switched off separately and drive the split spindle shafts of the machine. For each shaft, three different speeds can be preset via V-belts. It is even possible to adjust the speed steplessly with a frequency converter. Standard abrasive belts with a length of 3,500 mm and a maximum width of 100 mm can be used on the machine. The maximum dimensions of the Picard contact wheels are 450 x 100 mm with a bore of 35 mm. The stable design of the SMG 58 series ensures continuous, vibration-free operation during the machining process. 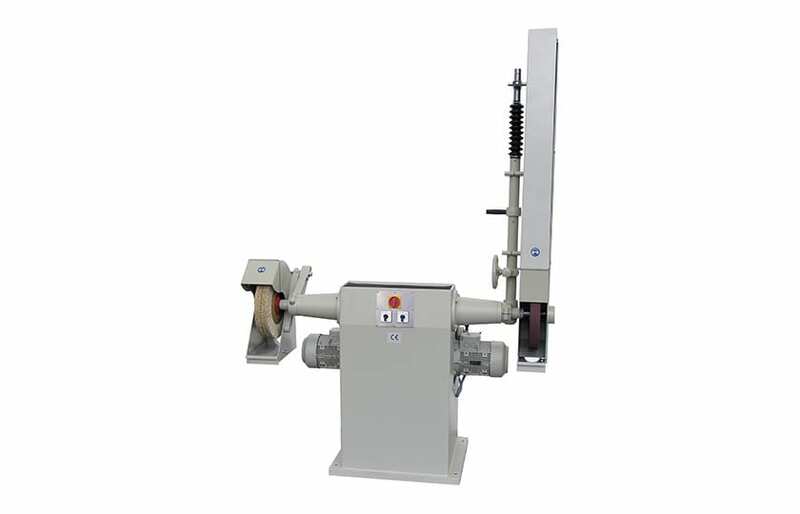 The belt grinding and polishing machine SMG 58 can be equipped with a low column (600 mm) or with a high column (1,000 mm) of the stand. The SMG 58 series is equipped with two motors mounted on the stator and has split spindle shafts. Both motors can be switched off separately. By the optional installation of a frequency converter, the spindle speeds can be infinitely adjusted by the machine operator in a range from 1,500 to 2,900 rpm.